"Karen Foster [as Isolde] made an impressive debut, with a solid voice and convincing power.... She internalized the strength of Wagner's character." "Karen Foster (Isolde) is powerful, and has a voice filled with nuance." "Karen Foster's Isolde fills the palette of emotions with conviction and flexibility, which will probably even increase in coming performances." "Karen Foster as Isolde is an elegant dramatic soprano." 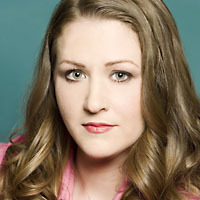 "Karen Foster has a powerful voice and portrayed the character well. The pinnacle was the final aria, ‘Mild und leise.'"